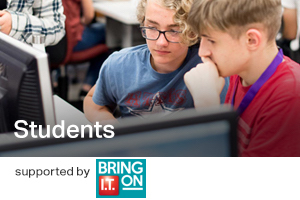 Belfast Met partnered with Women in Business recently to run the successful Bring It On event, bringing educators, teachers, pupils and industry professionals together in order to encourage pupils to take an interest in the IT sector. Belfast Met recently pulled together to run an event with Women in Business that aimed to give students an insight into what the various local tech job roles entail. The event consisted of a series of talks and workshops, with leading companies such as Fujitsu, Liberty IT, Deloitte, CME Group, Allstate and Kainos in attendance. Funding for the vent was provided due to the Department for the Economy, was able to play an important role in addressing skill shortages in NI.